When performing rhinoplasty, surgeons utilize one of two possible incisional approaches, which classify the surgery as an open or closed rhinoplasty. Also referred to as external rhinoplasty, open rhinoplasty is performed by making a small incision at the base of the nose, across the columella. This allows the surgeon to “open” up the nose to gain complete access to the underlying nasal structure during surgery. A closed, or endonasal, rhinoplasty is performed entirely through the nostrils and does not require an external incision. There is often much debate around which approach is superior, but in reality neither approach is better than the other. The decision to use an open or closed approach to rhinoplasty depends upon several factors, including the revisions being made, the patient’s nasal structure, and the surgeon’s preferences. This guide provides information about the open rhinoplasty approach. 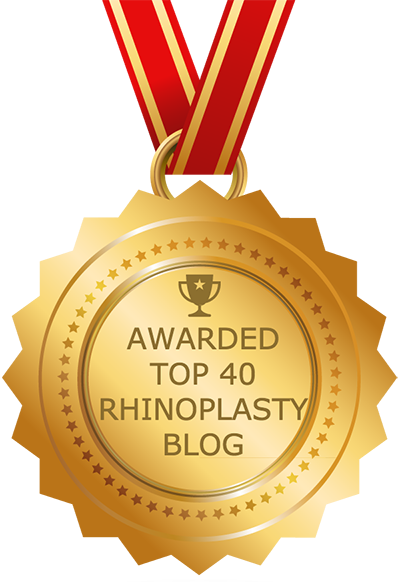 You can learn more about closed rhinoplasty in our Guide to Closed Rhinoplasty. The primary difference between and open and closed rhinoplasty occurs at the outset of the surgery. After the patient has been anesthetized, a surgeon performing an open rhinoplasty will make a small incision across the columella, the fleshy area located between the two nostrils. This is the only external incision that will be made during the surgery – additional internal incisions are made in both open and closed rhinoplasty to complete the nasal corrections. Once the trans-columella incision is made, the surgeon gently lifts the nasal skin upwards to allow access to the lower nasal framework, providing unimpeded visibility to the nose. From here, the surgeon will proceed with the agreed upon revisions to the nose. Once the changes are complete, the surgeon will reposition the nasal skin and meticulously suture the external incision to allow for the least amount of visible scarring. Open rhinoplasties provide surgeons with complete access and visibility into the nasal framework. This allows them make more complex changes that may not be possible with a closed rhinoplasty. Certain nasal deformities, such as those associated with twisted noses, cleft-lip, and cleft palate rhinoplasty, are almost always addressed through open rhinoplasty, as a closed rhinoplasty cannot provide the access required to correct these complex problems. Open rhinoplasty allows the surgeon to view the underlying nasal structures in their natural and undisturbed state. In a closed rhinoplasty, the nasal structure can become twisted and distorted as the surgeon struggles to gain access through the small nostril openings. An open rhinoplasty allows surgeons to make more accurate and precise changes by viewing the nose in its natural state. In addition, nasal cartilage is less likely to become damaged or distorted during an open rhinoplasty. Open rhinoplasty results in a small scar across the base of the nose, which for some is viewed as a disadvantage; however, when performed by a skilled surgeon, the scar should be minimal and barely visible to the casual observer. Most surgeons agree that the tradeoff of a tiny scar is worth the superior results that an open rhinoplasty can provide. While open rhinoplasty is considered more demanding than closed rhinoplasty, most experienced surgeons are able to perform open rhinoplasty and this approach is now the dominant one taught to medical students, residents and interns studying rhinoplasty. Some surgeons are not able to perform open rhinoplasty, so it’s important to understand the doctor’s skills and abilities before setting a surgical date. Neither method of rhinoplasty is superior to the other – open and closed rhinoplasties are both equally valid and important surgical approaches used to correct nasal deformities and reshape the nose. The decision to have an open or closed rhinoplasty is one that must be decided upon between the surgeon and patient. During the initial consultation, the surgeon will assess the patient’s needs and then make a recommendation for the best approach.